Largest city in the Transvaal and principal center of Jewish life in South Africa. The Jewish community there is estimated at 12,000 in a total population of 120,000—the largest relative number, outside of Aden and Gibraltar, in the entire British empire. From its foundation, immediately upon the discovery of the Witwatersrand gold-fields at the end of 1885, Jews have formed about 10 per cent of the white population. The first attempts at religious organization took place July 10, 1887, when about eighty-eight pioneers, mostly from the Barberton gold-fields, the Kimberley diamond-fields, the coast towns, England, and Australia, formed the Witwatersrand Gold-Fields' Jewish Association. A death having occurred as early as May 12, 1887, the Boer government made a grant of the present Jewish cemetery, in which, up to the end of 1903, 829 burials had taken place. During the greater festivals of 1887 the Rev. Joel Rabbinowitz of Cape Town conducted the services. On Jan. 29, 1888, the association bought two building-plots on President street for a synagogue, and at the same time changed its name to "Witwatersrand Hebrew Congregation." The Rev. Mark L. Harris of Kimberley, who preached at the laying of the foundation-stone (Nov. 9, 1888), was elected rabbi, retaining that post till March 31, 1898. He was succeeded by the Rev. W. Wolf (reader) and Dr. J. H. Hertz (rabbi). In 1891 two secessions occurred: a small Russian section formed the Bet ha-Midrash, with miḳweh, synagogue, and dayyan (Rabbi Dagutzky, succeeded by Rev. 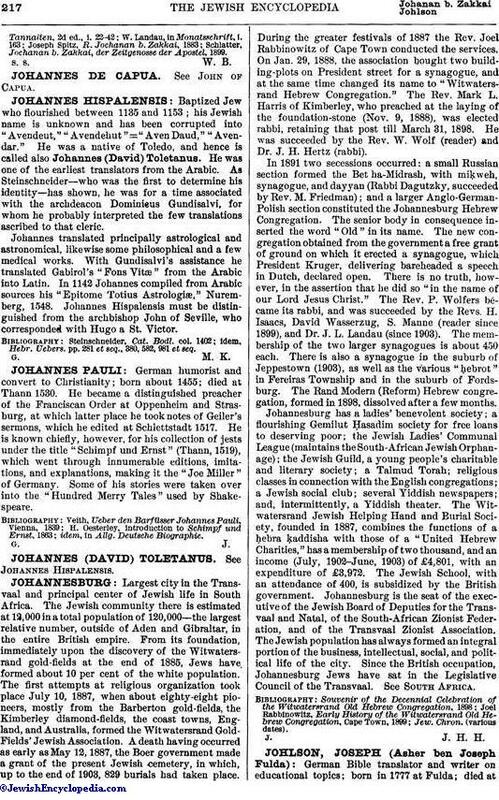 M. Friedman); and a larger Anglo-German-Polish section constituted the Johannesburg Hebrew Congregation. The senior body in consequence inserted the word "Old" in its name. The new congregation obtained from the government a free grant of ground on which it erected a synagogue, which President Kruger, delivering bareheaded a speech in Dutch, declared open. There is no truth, however, in the assertion that he did so "in the name of our Lord Jesus Christ." The Rev. P. Wolfers became its rabbi, and was succeeded by the Revs. H. Isaacs, David Wasserzug, S. Manne (reader since 1899), and Dr. J. L. Landau (since 1903). The membership of the two larger synagogues is about 450 each. There is also a synagogue in the suburb of Jeppestown (1903), as well as the various "ḥebrot" in Fereiras Township and in the suburb of Fordsburg. The Rand Modern (Reform) Hebrew congregation, formed in 1898, dissolved after a few months. Johannesburg has a ladies' benevolent society; a flourishing Gemilut Ḥasadim society for free loans to deserving poor; the Jewish Ladies' Communal League (maintains the South-African Jewish Orphanage); the Jewish Guild, a young people's charitable and literary society; a Talmud Torah; religious classes in connection with the English congregations; a Jewish social club; several Yiddish newspapers; and, intermittently, a Yiddish theater. The Witwatersrand Jewish Helping Hand and Burial Society, founded in 1887, combines the functions of a ḥebra ḳaddisha with those of a "United Hebrew Charities," has a membership of two thousand, and an income (July, 1902-June, 1903) of £4,801, with an expenditure of £3,972. The Jewish School, with an attendance of 400, is subsidized by the British government. Johannesburg is the seat of the executive of the Jewish Board of Deputies for the Transvaal and Natal, of the South-African Zionist Federation, and of the Transvaal Zionist Association. The Jewish population has always formed an integral portion of the business, intellectual, social, and political life of the city. Since the British occupation, Johannesburg Jews have sat in the Legislative Council of the Transvaal. See South Africa.